The ability to experience nature is paramount to human wellbeing. Cities are on a mission to green their urban landscapes, especially with over half of the world’s population living in cities. Yet, local governments lack proper tools to efficiently map and assess the amount, condition, and quality of parks, gardens, and other urban green space. As a result, it is difficult to formulate and execute policy goals with precision. Global Green City Watch aims to unlock valuable insights about the quality of urban green space by combining machine learning and image processing algorithms with DigitalGlobe’s high-resolution satellite imagery. In short: we’re monitoring the quality of urban green space, from space. A comprehensive literature review was conducted to explore the use of geospatial big data to assist in quality assessments of urban green space. 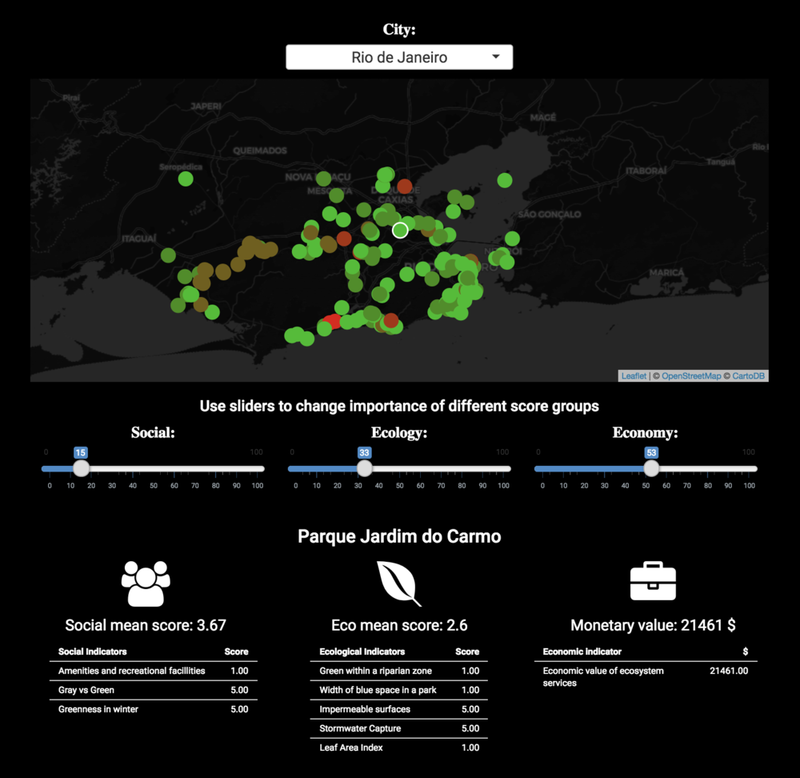 The results include a holistic indicator framework called the Urban Green Classification Index. The index, amongst other variables, includes the measuring of water bodies, composition of greenery, riparian (read: riverbank) vegetation, and the quantification and classification of recreational facilities. The indicators are scored from 1 (poor-quality) to 5 (high-quality) with respect to a specific green space. Access to the GBDX Platform and DigitalGlobe’s 100 PB imagery library enabled this process in an innovative way. With access to the data and OpenStreetMap, Global Green City Watch was able to classify and measure previously “invisible” objects, such playgrounds, benches, and riparian vegetation, which are essential for quality assessments. This dashboard makes insights actionable, but we want the back-end to be accessible as well. That is why, for the GBDX for Sustainability Challenge, we’ve delivered a streamlined, open-source python tool package alongside a flat datafile so that technical as well as non-technical audiences can use our results, replicate our methodology, and also tailor it to specific needs and extend or improve it. Notebook versions of our project will be published on the GBDX Platform for easy access to our toolbox. For more advanced users, our GitHub repository allows access to the source code of our tools and our dashboard.